The e-Lex Sportiva Journal is an other Official International Sports Law Journal of IASL published twice 2 per year and bound as a volume every year from EKEAD Center. It is directed by an Editorial Committee presided by Professor Dimitrios Panagiotopoulos, University of Athens. Aim: The development and the promotion of the Sports Law Science worldwide and of Lex Sportiva theory. The presentation of authentic jurisprudence of Sports Law and Sports Law Cases, specialized legislation’s and courts of justice nationally and internationally. e-Lex Sportiva Journal basic goal is to communicate and convey a scientific message of the emerging Science of Sports Law. Publications: Articles and Researches-based on sports law- are published into the e-Lex Sportiva Journal. The articles regarding the Sports relations (in the national and international level), and the sports organizations (their legal status and the law that governs their function), are also published in e-Sports Law Journal. Studies and researches about the labour relations in athletics and articles concerning the law of the Olympic Games are included also into this new Magazine, e-Lex Sportiva Journal. 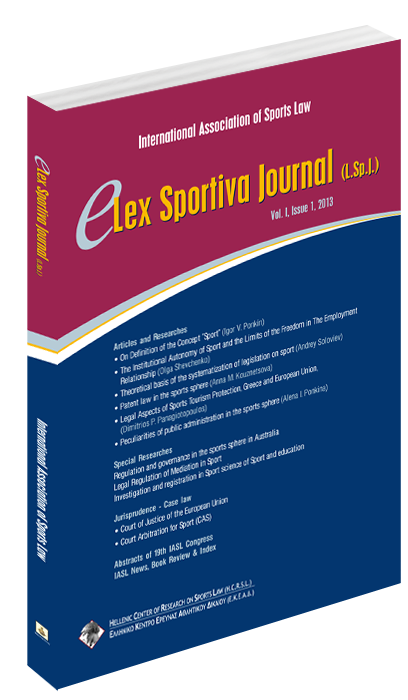 Till now, it is published the 1st volume of, e-Lex Sportiva Journal, Issues 1,2 (2013).